OSWEGO — SUNY Oswego faculty member, composer and percussionist Eric Schmitz and four colleagues will honor the jazz and music education legacy of the late Fred Sturm in a “Suite for Fred” performance at 7:30 p.m. Oct. 19, in Sheldon Hall ballroom. SUNY Oswego music instructor Danny Ziemann, an award-winning bassist, will be among five jazz musicians performing compositions by composer and percussionist Eric Schmitz, also of Oswego’s music faculty, in a Ke-Nekt Chamber Music Series concert at 7:30 p.m. Oct. 19 in Sheldon Hall ballroom in honor of the late Fred Sturm, a former jazz educator and composer at University of Rochester’s Eastman School of Music. 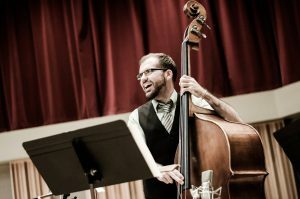 Schmitz, who has composed a four-part piece for the occasion, and fellow performers will deliver a talk at 7 p.m. preceding the concert, part of SUNY Oswego’s Ke-Nekt Chamber Music Series. Also appearing are pianist Chris Azzara and trombonist Mark Kellogg — both of whom, like Schmitz, studied under Sturm at University of Rochester’s Eastman School of Music — and fellow Eastman graduates Doug Stone on saxophone and SUNY Oswego music faculty member Danny Ziemann on bass. Sturm, an award-winning composer who taught at the Eastman School between two long tenures at Lawrence University in Appleton, Wisconsin, died in 2014 after inspiring generations of jazz students, educators and aficionados, Schmitz said. The concert will feature all-new music, said Schmitz, who composed and played in Eastman’s Jazz Ensemble and Studio Orchestra under Sturm’s guidance in 2001-02. The artists plan to record a CD of the music this fall for release later this year or in early spring, Schmitz said. Tickets for “Suite for Fred” are $15 ($5 for students) and are available at all SUNY Oswego box offices, online at tickets.oswego.edu or by calling 315-312-2141. Parking is included in the price of a ticket, and is available in the employee and commuter lots adjacent to and across Washington Boulevard from Sheldon Hall.